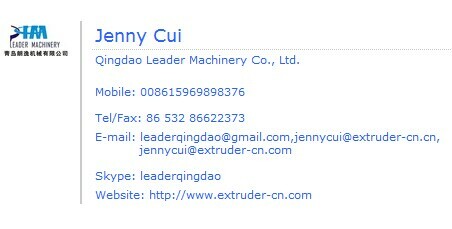 Qingdao Leader Machinery Co., Ltd. is a special professional manufacturing and supplying high-tech enterprises of new extrusion equipment. Since foundation, we follow: "Independent research and development and innovation", and have been dedicated to study and application of new products, new technology and new technology of plastics extrusion equipments on the basis of improving tradition, combined with international advanced manufacturing level, to create a first class among domestic products. Through ISO9001-2000 quality certification and CE certification, strict following the standards of modern enterprise, the overall strengthening the effective management of production, procurement, technology, quality and after-sale service, we win the market by high-quality products and services. At present, products have been exported to the United States, South Korea, Russia, Dubai, Turkey, Iran, Saudi Arabia, South Africa, Libya, Bangladesh, Mexico, Chile and other countries and regions, praised by customers.